Northwestern University’s SiNode Systems, a clean-tech startup that develops lithium-ion battery anodes that significantly increase energy capacity and charging speed, has won the second annual U.S. Department of Energy (DOE) National Clean Energy Business Plan Competition. SiNode’s innovative anode enables a battery to charge more quickly and hold a charge 10 times longer than current anode technology. The anode could greatly enhance battery life for electric vehicles and smartphones. SiNode Systems is the second student-led Northwestern startup to win the national title. NuMat Technologies, which designs high-performance materials for the safe and efficient storage of gases such as natural gas, won last year’s inaugural competition. SiNode bested five other clean energy technology teams from universities across the country at the national competition held June 11 and 12 in Washington, D.C. All six teams had won regional business plan competitions to advance to the final. 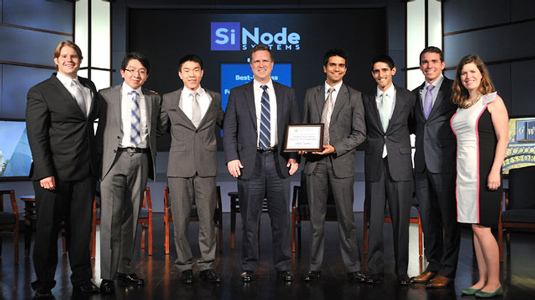 SiNode’s win came at the 2013 Rice Business Plan Competition in April. Spun out of research labs at Northwestern, SiNode impressed the judges with its commercialization approach, go-to market strategy, talented team members, environmental benefits and potential impact on America’s clean energy economy. David Danielson, assistant secretary for energy efficiency and renewable energy at the U.S. Department of Energy announced the good news at the awards ceremony June 12 at George Washington University. The title carries with it $100,000 in cash and services. Part of the Obama administration’s Startup America Initiative, the DOE competition promotes entrepreneurship in clean energy technologies. It is designed to find companies that will lay the groundwork for future economic opportunities that will ensure America remains competitive in the global clean energy race. “This impressive and talented multidisciplinary team is tackling a problem well known to many of us, and I couldn’t be more proud of them,” said Northwestern Vice President for Research Jay Walsh. SiNode Systems is made up of six Northwestern graduate students. Samir Mayekar (chief executive officer), Nishit Mehta (vice president of business development) and Guy Peterson (vice president of commercialization and manufacturing) are pursuing MBA degrees at the Kellogg School of Management. Joshua Lau and Thomas Yu (research engineers) are pursuing, respectively, masters and doctoral degrees in materials science and engineering at the McCormick School of Engineering and Applied Science. And Cary Hayner (chief technology officer) is a doctoral candidate in chemical and biological engineering at the McCormick School. “We are proud to be the second Northwestern team in a row to win the Department of Energy’s top prize for a student-led clean energy venture,” said CEO Mayekar, who is completing his second degree at Northwestern, having received his bachelor’s degree from the Weinberg College of Arts and Sciences. The young company represents a well-established and growing trend of student entrepreneurship at Northwestern. The number of student startups has doubled in the past year, supported by the Northwestern University Incubator in downtown Evanston, the NUvention program that offers entrepreneurship courses, and student-run groups such as InNUvation. SiNode is a product of the 2012 NUvention: Energy course. Lithium-ion batteries have become the primary technology powering the rapid growth of portable electronics and, more recently, electric vehicles. SiNode’s battery technology allows for safe and rapid charge movement, opening up the possibility of high-efficiency electric vehicles and smartphones that can charge in minutes. The company utilizes a composite material of silicon nanoparticles and graphene in a layered structure to eliminate the rapid degradation of performance associated with silicon-based anode materials. The patent-protected technology was developed in the labs of Harold H. Kung, professor of chemical and biological engineering in the McCormick School and inventor of the SiNode technology. “It is exciting to see that Northwestern has very successfully developed a culture of cross-disciplinary cooperation, not only among faculty but students as well,” said Kung, who also is director of Northwestern’s Center for Energy Efficient Transportation. By involving students from two schools at Northwestern and who represent different disciplines, SiNode Systems embodies a number of elements of the vision outlined in the University’s Strategic Plan: discovering creative solutions and interdisciplinary collaboration.